A solvent is a substance that dissolves another substance or substances to form a solution (a homogeneous mixture). The solvent is the component in the solution that is present in the largest amount or is the one that determines the state of matter (i.e. solid, liquid, gas) of the solution. Solvents are usually, but not always, liquids. They can also be gases or solids. The material dissolved in the solvent is called the solute. Together, the solvent and solute comprise the solution. In a solution containing 5 grams of sugar and 1 liter (1000 grams) of water, the water is the solvent because it is present in the largest quantity. In a solution containing 300 grams of calcium chloride (CaCl2) and 200 grams of water, water is considered the solvent even though it is not present in the greatest amount because this mixture is a liquid like water, not a solid like calcium chloride. In a mixture containing 5% hydrogen gas and 95% hydrogen gas by volume, the hydrogen gas is the solvent. "Silver" dental fillings (amalgams) are a solid 8:1 mixture of tin and mercury. In this case, tin is the solvent. Such metal alloys are sometimes called "solid solutions". 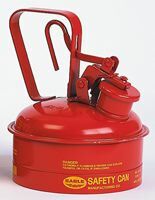 Store flammable solvents safely with safety cans from Safety Emporium. The most common solvent most of us encounter is water (H2O). Liquid solutions having water as a solvent are called aqueous solutions. Water can dissolve many substances, but not all (see solubility). Liquid solutions that do not have water as a solvent are called non-aqueous solutions. A broad and common class of non-aqueous solvents is called organic solvents; see the entry on organic for more about organic materials. Organic solvents are usually flammable materials and may pose certain both physical and chemical hazards. If your solvents are flammable, be aware that they can be ignited by the static electricity generated by pouring solvent from one container to another. When this potential exists, containers must be properly bonded and grounded; see the last three links under Further Reading (below) for more information. Organic solvents which are volatile are called VOC's - volatile organic compounds. Not only are many VOC's flammable or capable of causing explosions, they are also usually not healthy to inhale. Examples include aromatics such a benzene and halogenated hydrocarbons such as carbon tetrachloride. Because of these physical and health hazards, the use of organic solvents on an industrial scale leads to significant environmental and worker safety concerns as well as expensive purchasing and disposal costs. Over the past decade, there has been tremendous focus on green chemistry, an approach which focuses on production processes that reduce or eliminate the use and generation of hazardous substances. Green chemistry also emphasizes "atom economy" in which the quantities of the starting materials and byproducts of a reaction are reduced to a minimum. Green Chemistry is turning out to be a fantastic approach that often results in far lower costs of production while benefiting the environment and protecting workers. For more on Green Chemistry, see the Further Reading links below. "Solvent Recovery Handbook, Second Edition", Hardcover, 342 pages, 2002. Estimated price $371.85. Info and/or order. "Handbook of Solvents (Chemicals)", Hardcover, 1,650 pages, 2000. Estimated price $295.00. Info and/or order. "Solvents and Solvent Effects in Organic Chemistry", Hardcover, 653 pages, 2010. Estimated price $150.00. Info and/or order. "Solvent Extraction Principles and Practice, Revised and Expanded", Hardcover, 480 pages, 2004. Estimated price $159.96. Info and/or order. "Green Solvents: For Organic Synthesis", Hardcover, 300 pages, 2009. Estimated price $99.00. Info and/or order. "Solvent Neurotoxicity", Hardcover, 400 pages, 1992. Estimated price $349.95. Info and/or order . Fire codes require that flammable solvents are properly stored in cabinets like these from Safety Emporium. If you are using a substance as a solvent, that generally means you'll be using a large quantity of it. Therefore, read the MSDS before working with it so you'll know what to do in the event of spill or exposure to the material and to assess any potential health, fire or explosion hazards. Pay close attention to selecting the proper gloves with a solvent. Regular latex gloves easily degrade in certain solvents and/or permit solvent and solute molecules to pass through. In 1997, an experienced laboratory researcher died when she spilled two drops of a compound on her latex gloves. See this article for details. Some solvents, such as dimethylsulfoxide (DMSO, (CH3)2SO), are very effective at making compounds enter the body through the skin -- even when these compounds do not normally do so. Therefore, always be sure to use the proper gloves! (see links below). If you do not have adequate engineering controls such as a fume hood, a respirator is a good idea. And always be sure to have proper ventilation. The Presidential Green Chemistry Challenge at the US EPA. GEMS: Greener Education Materials For Chemists, an interactive database of chemistry education materials focused on green chemistry. Green Chemistry Articles that have appeared in the American Chemical Society's Chemical and Engineering News . Health Hazards of Occupational Exposure to Industrial Solvents at the University of Hong Kong. Solvents at Work by the Workers Health Care Centre, Australia. Working Safely With Solvents from the U.K.'S HSE. The solvent entry at Toxipedia has user-edited writeups on some common solvents. 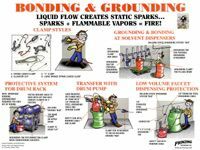 How Do I Work Safely with Flammable and Combustible Liquids? (Static Electricity) from the Canadian Centre For Occupational Health & Safety. This Chemical Safety Board report details an accident resulting from inadequate electrical bonding and grounding during the filling of a portable steel tank. Fairdale (Louisville, KY) home explosion puts firefighter in ICU (2010), a fire caused when acetone vapors ignited in a basement. See also: Concentration units, mole, nitrile, narcosis, personal protective equipment, solubility, solution. Posters for the safe handling of flammable and combustible liquids are available at Safety Emporium.